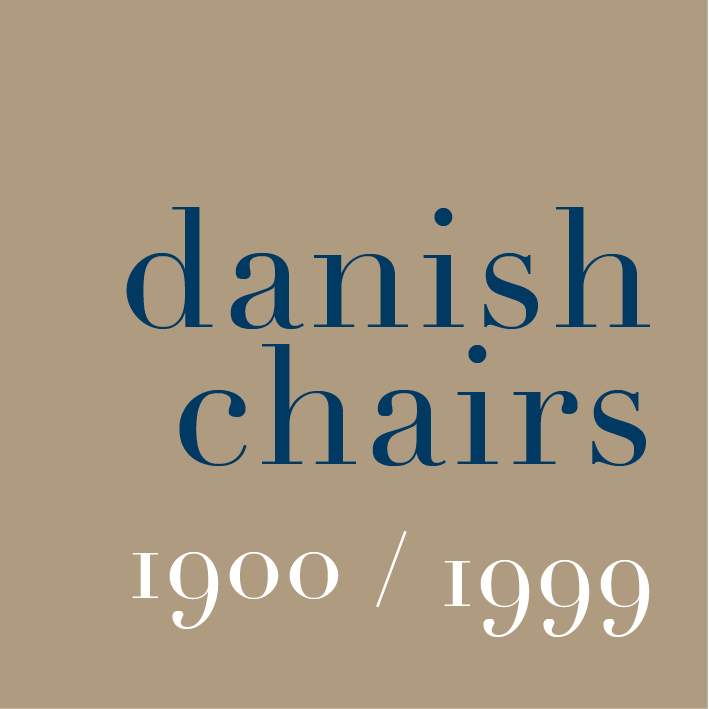 Designed by Kaare Klint for Kunstindustrimuseet - the Danish Museum of Art and Design that is now called Designmuseum Danmark. The largest version of the chair was used in the lecture theatre in the museum but there are also two smaller versions to fit at a table or desk and also two versions of the red Chair were made with arms - one with plain wood arms and another with padded or upholstered arm rests. It is too easy now to dismiss this chair as 'old-fashioned' or at least not particularly relevant to what is happening now in modern chair design and that is, in part, simply because it is not a type or style of chair that is now popular. 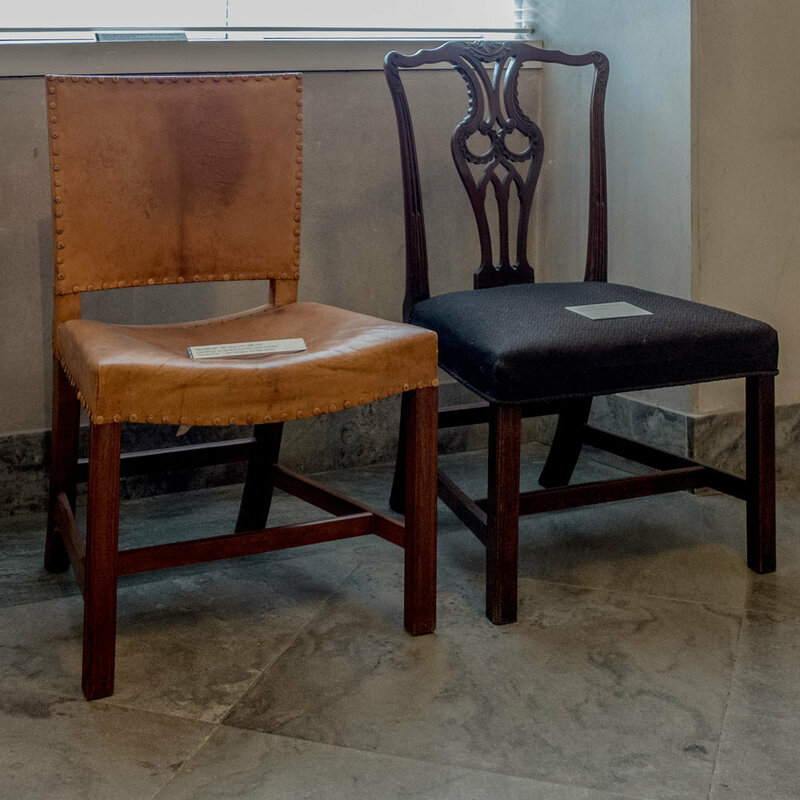 Klint himself acknowledged how much the chair was inspired by the so-called Chippendale chair - an English chair that dates from the middle of the 18th-century and was in the collection of the museum when Klint taught there. That is, the Red Chair is inspired by the style of the earlier chair, that was well made, solid and sitting confidently and square to the floor, with a hard wood frame and upholstered seat but what is crucial is that in his reworking of the design Klint analysed and re-assessed the details of the construction so, for instance in the use of plain but carefully positioned stretchers between the legs of the chair that not only makes it stronger but gives it a balance as well as contributing to that sense that it is a well-set chair. The Red Chair is also important because it has a carefully contrived simplicity - which means that it is carefully designed and is more complicated in its construction than might appear. It has a conventionally upholstered seat that is not straight, flat or horizontal but dips down at the front and the back legs are not set square or vertical but are angled back from the back of the seat so again making the chair much more stable but also making it more difficult to make. And the solid comfort of the chair also expresses a sense of quality … a sense that this is a sensible and robust chair for relatively heavy use in a public space but certainly not that it is a cheap chair. 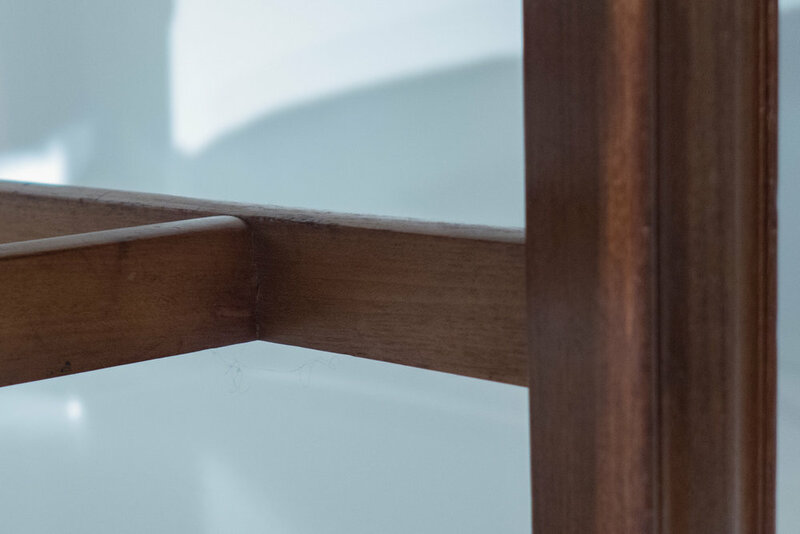 What you see here is how Klint brought to his furniture design an almost clinical analysis of form and construction and that is new. The chair was also produced in relatively large numbers so although it could not be described as a factory product it must have been seen as a significant and prestigious commission for the cabinetmaker Rud Rasmussen. 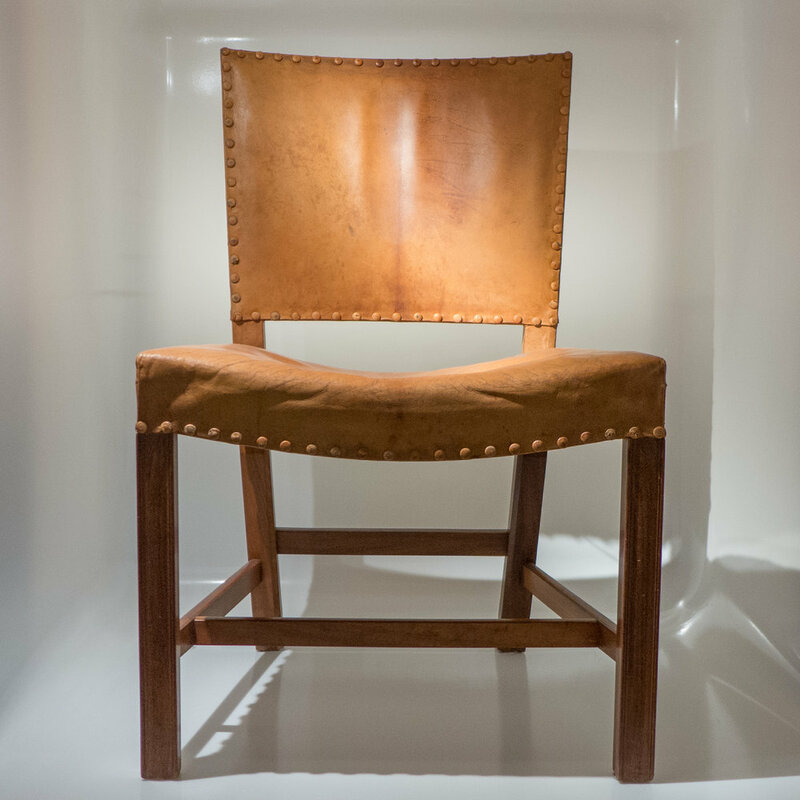 Rud Rasmussen included the chair with their work shown at the Cabinetmakers' Exhibition in 1931. A review of the exhibition noted that, unlike other contributors that year, Rasmussen and Klint did not show the furniture in a room setting but exhibited working drawings and photographs on the wall behind the furniture - so clearly this was a much more academic presentation. A comment in the Copenhagen newspaper Politiken has resonance now for the reviewer of the exhibition pointed out that …. … but he also went on to note that this chair had become a successful and profitable export piece. Klint designed a number of chairs that were a variation of the Red Chair and other designers also produced chairs of this Red Chair Type - discussed in a separate post. At least one set of the chairs was covered with red Niger goat skin so hence the name Red Chair. 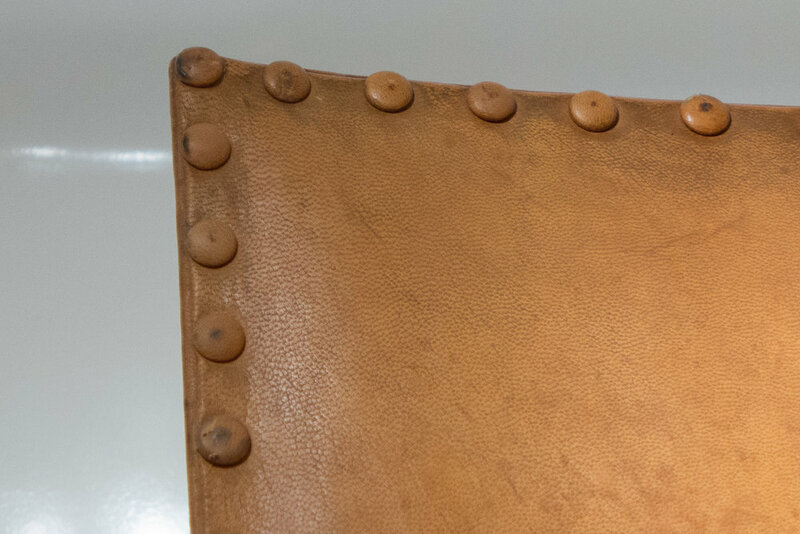 The leather is stretched over the upholstery and nailed, with precisely spaced and covered nails, on the bottom outward-facing edge of the seat and around the edge of the front of the back rest as a decorative feature that comes directly from the method of construction. 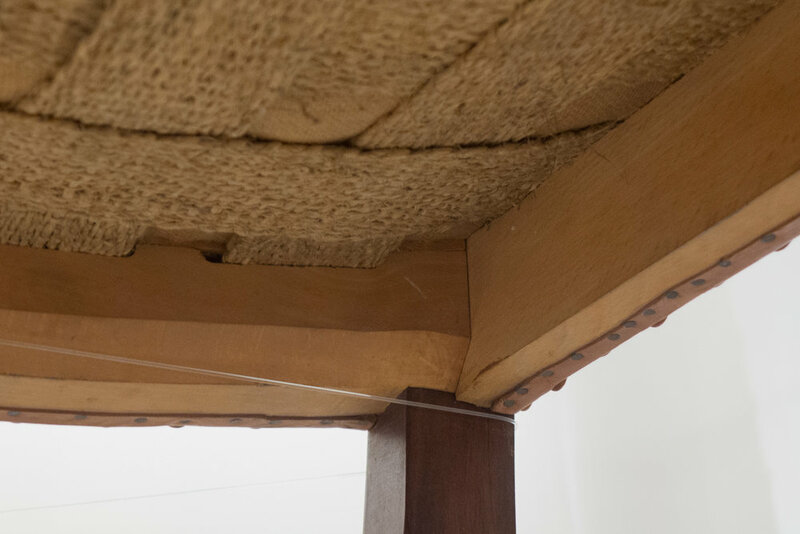 Seen from the underside, the upholstery of the seat is over a strong webbing and the thicker back rail means that the verticals of the back are clasped to make a stronger join. 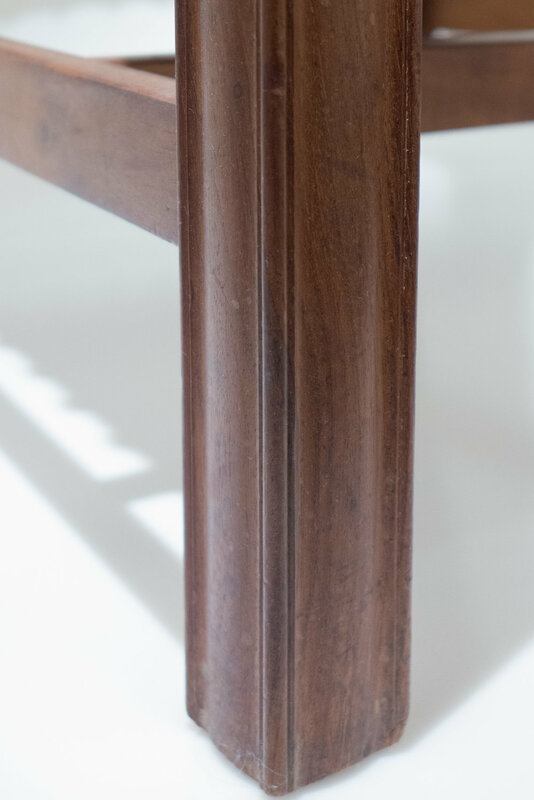 Down the front and side of the front legs is a shallow but elegant and symmetrical wave moulding and the stretchers and cross rail have a shallow rounding so the frame appears to be simple and straightforward but has a subtle and understated finish from the cabinetmaker.